The third of Legendary Games’ class-centric Ultimate Plug-ins clocks in at 44 pages, 1 page front cover, 1 page inside of front cover, 2 pages of editorial, 2 pages of introduction, 1 page SRD, 3 pages of advertisement, 1 page inside of back cover, 1 page back cover, leaving us with 32 pages of content, so let’s take a look! Before we do, please let me ensure we’re all on the same page: When the gunslinger was released, I was pretty much ecstatic at first: Firearms? Yeah! Beyond that, the idea of making deeds partially rule-of-cool regarding grit-regaining put some sorely needed option for table variance in the GM’s hands – I like the ideas of the gunslinger. I absolutely learned to LOATHE the execution. You see, obviously, I had a gunslinger-PC almost immediately…only to note that the poor class suffers from two crucial flaws: 1) Lack of player agenda. The player has nothing to choose from – NOTHING. Vanilla gunslingers are ridiculously uniform and boring – also thanks to the deed-system. 2) The class does not account for table variation regarding the, particularly at low levels, significant upkeep cost of firearms and their explosion-prone design. (That’s before the swift action-drought…) These two components and their importance only dawned upon me to their full extent then and they were pretty much what was inspired me to write the etherslinger-class for Interjection Games’ Strange Magic. It is no secret that I was tremendously disappointed by the Advanced Class Guide and probably would have sold it without my obligations as a reviewer to you, my readers. No other class in the ACG disappointed me quite to the extent the swashbuckler did. 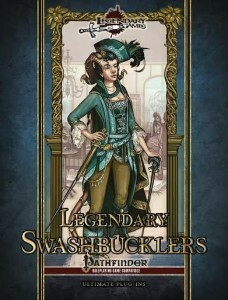 Taking a cue from the gunslinger with basically one signature deed, the swashbuckler as a default class lacks variance and becomes obsolete fast – I can’t, for the life of me, find a good reason to take swashbuckler levels beyond 5th level, when Improved Critical early access makes them good crit-fishers. Worse, the swashbuckler’s choices, limited to bonus feats, are simply not that relevant – heck, there are base classes with spellcasting progression that receive MORE feats than these poor guys. Beyond these issues, I think the swashbuckler is simply not doing a good job at making a swashbuckling character – skirmishing is still problematic and not too efficient and e.g. iconic banter and weapon binding have been done better (or done at all!) by various 3pps – running a vanilla swashbuckler for comparison purposes…was not something my players were keen on. After the superb installment on Legendary Rogues, let’s take a look whether the class’s redesign championed herein does fix these issues or not. From the get-go, you’ll note something: The Swashbuckler as presented herein is not presented as a big toolkit, but instead begins with the new base-class. The Legendary Swashbuckler receives d10, full BAB-progression, good Ref-saves, 4+Int skills per level, proficiency with simple and martial weapons and light armor as well as bucklers. At first level the LS (Legendary Swashbuckler) gets Charisma modifier panache, minimum 1, with critical hits and killing blows as means to regain panache – of course, non-kitten-able. Somewhat to my own disappointment (though I guess people liking the deed-system’s execution as opposed to its intent), the deed-system is retained, which means that there’s not more choice introduced in this component. Regarding deeds, derring-do remains unchanged, and so is Opportune Parry and Riposte, but instead of Dodging Panache, the LS receives Precise Strike at 1st level, adding his class level to damage with weapons held in the primary hand, provided they belong to the category chosen via swashbuckler weapon training. Two-handed weapons receive only 1/2 this bonus damage and it may be applied to thrown weapons if the target is within 30 ft. This ability only works while the swashbuckler has at least 1 panache and spending one panache doubles the bonus damage for one attack, thankfully preventing AoO-abuse here. At 3rd level, we notice Kip-Up and Swashbuckler’s Initiative still around; however, in an interesting twist, charmed life has been turned into a deed – and it works much better. Where the original lacked an organic scaling mechanism (introducing its own instead of class resources), the deed-version utilized here requires at least 1 panache…but not its expenditure. Basically, the daily limitation is gone, representing a power-upgrade on the defensive side here. There is also a new deed here, the daring stride: Spend 1 panache for an immediate action 5-foot sidestep that grants Charisma-modifier as a dodge bonus; this does not count as a five-foot-step and provokes AoOs from foes other than the one triggering the activation in the first place. I like this one, because it actually emphasizes…oh, I don’t know….movement in battle, pretty much what the original swashbuckler should have done? At 7th level, the class unlocks targeted strike, but interestingly, not superior feint, while 11th level provides subtle blade and bleeding wound…but where is evasive? Well, it is taken out of the deed-system: At 2nd level, the LS receives uncanny dodge, 3rd nets nimble, 6th evasion, 8th improved uncanny dodge and 14th improved evasion – which feels more organic to me, so no complaints here. But back to the deeds: 15th level unlocks perfect thrust and swashbuckler’s edge and 19th level retains cheat death and deadly stab, which btw. thankfully gets rid of the strange division into lethal and nonlethal, instead codifying the whole package in one concise ability. Swashbuckler Weapon training is first granted at 1st level and 3rd nets Dexterity to damage instead of Strength, as per Finesse Training, tying the mechanic to weapon groups, a practice the auto-confirms of the capstone also utilize. Another diverging thing about the LS is that the class receives a so-called personage at 1st level – these are practically built-in mystery plus-level of complexity modifications of the base class, finally introducing much needed variability into the rigid chassis of the class – a total of 7 such personages are provided and each comes with a linear list of ability-progressions associated with the respective personage as well as exclusive deeds unlocked at certain levels. As a minor nitpick regarding organization, I think they should have been put right after the class, not after the class’s archetypes, but that may ultimately just be me and a personal preference. Oh, before I forget – the class does not offer Cha-for-Int-prereq-qualification anymore. The first personage would be the braggart – which brought a big, big smile to my face. Why? Well, if you’ve been following my reviews, you’ll remember (and probably will be using) a glorious little pdf called Psychological Combat, later to be expanded into the absolutely superb Ultimate Charisma, both by Alexander Augunas’ Everyman Gaming. In short, the pdf managed to codify properly antagonizing foes, while also streamlining feint and demoralize into a more concise whole, rendering the pdf not only a Top Ten file, but also one of the most used crunch books at my table. Even better yet – while the personage does provide beautiful synergy with this inspired little book, the whole personage also comes with an alternate version that lacks exactly these components for those of you who do not own these inspired rules. Suffice to say, I wholeheartedly enjoy this particular personage. If my environment is any indication, were I a swashbuckler, I’d probably need to take the second personage – the dandy. Focused on social tricks, rogue talents (and, if you’re using pathfinder Unchained, optionally signature skills), the dandy makes for a cool martial face for the group. The daredevil personage is all about the option to move around the battlefield, automatically succeeding Acrobatics DC 20 or below, swiftly moving through difficult terrain and similar options. While I think Spring Attack as a 10th level bonus feat sans prereqs may be a bit late in the overall build, the personage nevertheless lets you make a pretty neat skirmisher. The Madcap personage is also about high risks and high rewards, rewarding risky playstyles: Provoked AoOs regain panache and similarly, being hit with a critical hit nets even more panache, depending on critical multiplier. Unfortunately, the former AoO-regain is basically a kitten-debacle waiting to happen, meaning this will never get anywhere near my table – I get the intent of this one and consider it great, but the omission of an anti-abuse caveat wrecks this personage for me. The phantom personage is the one that takes a cue (though a surprisingly good one) from Ultimate Intrigue, featuring the Batman/Zorro-like option to have dual personalities, including actually feasible quick change times between the two (no, not 1 minute…thankfully…) and options to separate the truths of his personas in his mind – whether for the aforementioned masked hero trickery or as a frame-work for multiple personality heroes, this is truly interesting. More fitting for pirates, post-apocalyptic contexts would probably be the raider with the rope-specializations and alcohol-fueled panache (which is erroneously called grit once)…and yes, thankfully, these grog points are abuse-safe. Finally, it is with the vagabond, master of dirty fighting, that we meet superior feint again. Beyond these personages that are hard-coded into the legendary swashbuckler, there obviously are archetypes – 16 to be precise. The Daring Infiltrator, Flying Blade, Inspired Blade, Mouser, Musketeer, Mysterious Avenger, Picaroon and Whirling Dervish archetypes of the base class have been aligned with the legendary swashbuckler – with the corsair obviously now rather being covered by aforementioned personage. But there also are new ones here – the Dashing Commander is the adaption of the archetype from Everyman Gaming’s Swashbuckler Archetype pdf and still remains primarily a Battle Cry-specialist and similarly, the rapscallion was also converted, still sporting dirty trick and sneak attack mastery. The two-weapon duelist’s LS-version deserves special mention, as it at least slightly makes two weapon fighting more dynamic, while the vainglorious swashbuckler probably is the most deceptive of designs here – obviously made for guys like yours truly, these guys can get personal deeds, highly customizable regular ones as well as panache-powered feat-use for a truly customizable playing experience, something I always tend to enjoy – particularly since lists of feats with associated costs, as per my experience, rank among the most deceptively easy-looking, yet hard things to codify in PFRPG. There are, however, also archetypes herein that are not based on other swashbuckling material recodified for the legendary swashbuckler – for example the gallivant, which would be a feasible mounted swashbuckler (combine with phantom for Zorro-the class…). There also would be the ronin, who has a personalized code, including limited resolve and favored weapon training as well as order abilities. In conjunction with the swashbuckler base abilities, that may be a bit much in comparison. Finally, the tumbler receives reflexive Acrobatics-based attack negation powered by panache and specific weapon training that includes options to skirmish sans AoOs and gain Vital Strike’s benefits with the chosen weapon groups – per se an interesting one in that it actually makes the skirmishing playstyle more valid. The pdf also includes a PrC, the Dervish Darter, which clocks in at full BAB-progression, d10, 4+Intelligence modifier skills, good Ref-save progression and relatively easy access at 6 ranks and only 3 feats prereqs. Beyond gaining 1/2 panache/deed progression at 2nd level (nice!) the PrC gets bonus damage that scales when skirmishing, further enhancing said playstyle – though, in a humorous glitch, the bonus damage at 1d5 is probably a typo – unless we’re now using DCC-style special dice… 😉 Kidding aside, apart from this minor glitch, the PrC receives a talent, a so-called dervish trick, at 2nd level and every 2 levels thereafter – though here, there are some minor ambiguities: Darter’s Sprint, for example: This one adds “1/2 his speed” to the distance when running, charging or withdrawing – while not bad, does this extend to non-standard movement rates as flying, burrowing etc. when granted by spells and/or effects? I think it probably should not, but I ultimately am not 100% sure. While such minor hiccups are a tad bit annoying, the PrC does manage to make the agile combatant pretty awesome and usable, so yes, this does have my blessing – flexible charges and zig-zagging movement are some of my favorites – though, frankly, I wished the rules-language was a tad bit more precise: At 10th level, the dervish darter (here called “dervish dancer”…) can charge and has “no restrictions on his movement” – does this allow you to charge over lava? Through walls of force? When bound? When having movement rate reduced to 0 ft.? I’m ultimately not 100% sure what the capstone is supposed to do. Beyond a brief list of weapon properties particularly suitable for swashbuckler characters, there are also three new ones, from balancing to weightless weapons…though the memory lapse-inducing blackout weapon is ultimately what makes this awesome. The pdf then concludes with a bunch of specific weapons and wondrous items, including an identity-shielding mask (thank you!) and literally tiny metallic bugs to track foes, ending on an imaginative, high note. Editing and formatting are good, though by far not as streamlined as usual for Legendary Games – there are a tad bit more avoidable glitches, some of which, unfortunately extend to the rules-language, which is particularly odd since both Jason nelson and Alexander Augunas’ writing tends to be extremely concise in that regard. Now, don’t get me wrong – this is still a tight book…but it’s not perfect. Layout adheres to legendary Games two-column full-color standard and the pdf comes fully bookmarked for your convenience. the book also sports quite a few nice original full-color artworks. Legendary Swashbuckler succeeds triumphantly in one simple regard: Making one of the choice-wise blandest, uninvolving classes in PFRPG actually provide variety, meaningful choices. The legendary swashbuckler herein is absolutely and without a single second of doubt superior in every way to the default swashbuckler by virtue of the significantly extended options available. The legendary swashbuckler is a nice class that makes skirmishing a valid option via the wealth of choices herein. The fact that a cover identity herein is not something that cripples you every time you’re surprised is also a component that should be lauded. Let me state, thus, loud and clear, that this still is THE swashbuckler-resource, the redesign of the class is desperately needed and a must-have for fans of the concept and frame of the swashbuckler – hence, my final verdict will clock in at 4.5 stars, rounded up to 5 for the purpose of this platform, with a must-have buy-now-recommendation for everyone dissatisfied by the vanilla swashbuckler – this is the class you deserved and wanted.